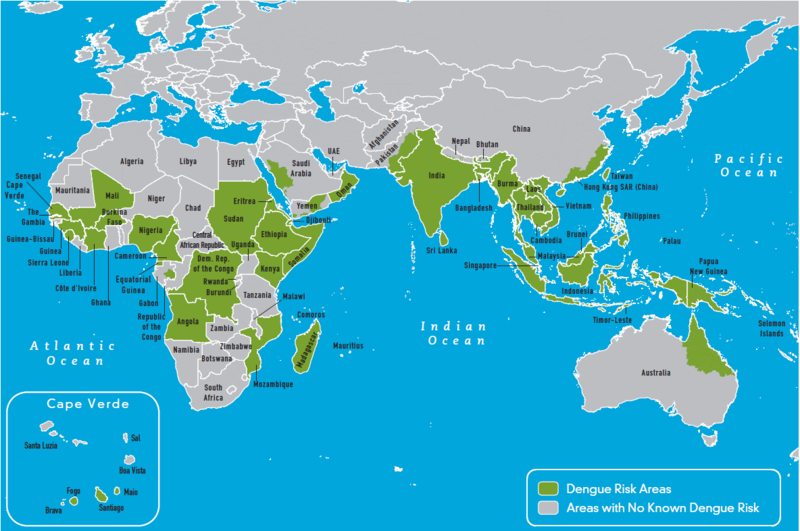 Dengue fever is an important mosquito-borne disease worldwide. It is caused by four related dengue viruses (DEN-1, DEN-2, DEN-3, DEN-4) that are related to the viruses that cause West Nile infection and yellow fever. Dengue fever can be a painful, debilitating disease but is rarely fatal. Symptoms appear 3-14 days after the bite of an infected mosquito and include sudden onset of fever, severe headache, eye pain, muscle and joint pain (giving the disease the nickname "breakbone fever"), and bleeding. Gastrointestinal symptoms like vomiting and diarrhea may also be present in some cases. Dengue fever symptoms usually lasts 4-7 days. The disease is often diagnosed incorrectly because the symptoms are similar to influenza and other viruses. Dengue hemorrhagic fever is a rare but more severe form of dengue infection that can be fatal if not recognized and treated with supportive care. The primary risk factor for hemorrhagic fever is previous infection with a different dengue serotype (i.e. getting DENV-2 if you have already DENV-1 puts you at increased risk of hemorrhagic fever). There is no treatment for dengue fever or dengue hemorrhagic fever, but quick recognition and management of symptoms and complications is effective at preventing deaths. There is currently no vaccine for dengue and the research has been challenging due to variation in the four viral types, but multiple vaccine candidates are currently in development. 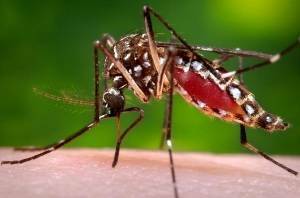 Dengue infection is acquired through the bite of certain species of mosquitoes, primarily Aedes aegypti, but also Aedes albopictus, both of which are present in Florida. It is important to note that a person can be infected with chikungunya and dengue viruses at the same time as they are both carried by the same types of mosquitoes. Therefore, it is important that providers consider both dengue fever and CHIK when evaluating suspect cases with travel to areas where both viruses are present. Testing is the only way for a health care provider to definitively differentiate CHIK and dengue fever. While previously present in Florida, the virus was eliminated from the United States several decades ago. Since then, a small number of cases have been reported each year in individuals with recent travel history to a dengue-endemic country. Until 2009, there were no reports of dengue acquired in Florida since 1934. In 2009 -2010, an outbreak of dengue was identified in Key West. A total 22 persons were identified with dengue fever in Key West during the summer and fall of 2009. In 2010, 66 cases of locally acquired dengue associated with Key West were reported in Florida with onset dates between March and November 2010. No dengue cases were reported in Key West after November 2010. Several cases are reported in Florida each year in travelers to areas where the disease is present. 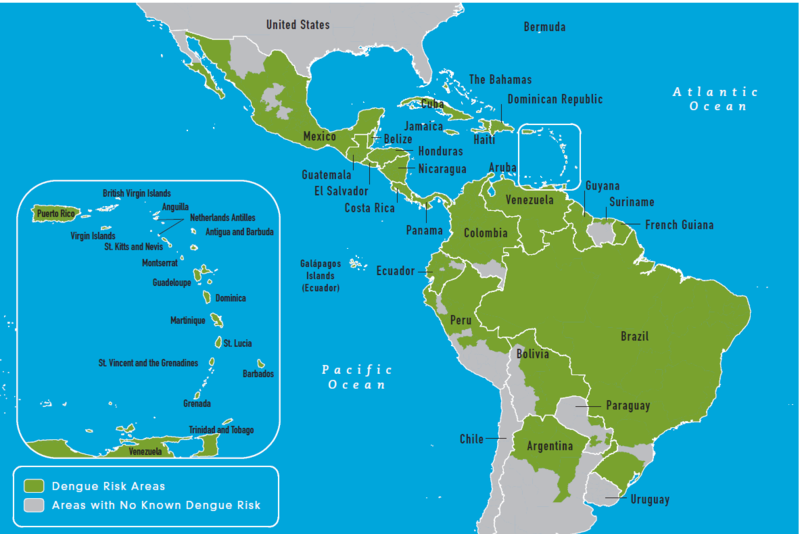 These imported cases are usually from dengue endemic regions such as the Caribbean, Central and South America, and Asia. The close proximity of areas with dengue such as Puerto Rico and frequent international travel in Florida residents and immigrants makes it possible to have dengue re-introduced. Several transient dengue introductions have been identified in Florida since the Key West outbreak. The Martin County outbreak in 2013, was the only introduction since the Key West event that has resulted in persistent transmission. There is some evidence that the United States lifestyle, such as routine use of air conditioning and screened windows, as well as spending more time indoors, may protect us from having large outbreaks. If you are traveling to a tropical or sub-tropical area (Africa, Asia, Caribbean, Central and South America), you can protect yourself from dengue and other mosquito-borne diseases by following the suggestions on our Prevention page, including using insect repellent. You can get more information about Traveler's Health from CDC - Travel & Dengue Outbreaks. Radke EG, Gregory CJ, Kintziger KW, Sauber-Schatz EK, Hunsperger EA, Gallagher GR, et al. Dengue outbreak in Key West, Florida, USA, 2009. Emerg Infect Dis. 2011 Jan.
Kyle J, Harris E. Global Spread and Persistence of Dengue. Annual Review of Microbiology. 2008; 62: 71-92. Wilder-Smith A, Schwartz E. Dengue in Travelers. New England Journal of Medicine. 2005; 353(9): 924-932. Reiter P, Lathrop S, Bunning M, Biggerstaff B, Singer D, et al. Texas Lifestyle Limits Transmission of Dengue Virus. Emerging Infectious Diseases. 2003; 9(1): 86-89.